Many couples who are racing to divorce in 2018 may be surprised to learn that even though the tax character of alimony remains unchanged in 2018 and will be grandfathered, other changes in personal and business income taxes will absolutely impact their financial outcomes. Clearly, the spectrum of changes in the “Tax Cuts and Jobs Act” (H.R. 1) for individuals ranges from tax brackets, deductions, and tax credits to tax shelters. It is unclear if these new rules will make divorce more or less difficult to negotiate, but drafting agreements to reflect financial intent will be riskier for attorneys than before. Why? Many of the tax law changes take place effective 1/1/2018. However, the alimony rule for those divorced changes only after 12/31/2018. This means there is a one-year span during which many individuals will experience considerable differences in their tax situation and lifestyle long before the impact of the new alimony rule becomes effective. Those who divorce before 12/31/2018 will be grandfathered under the existing IRS rules for alimony, but at the same time, face many law changes that affect their net disposable income calculations. Those who divorce when the new rule is effective must chart new territory in their financial negotiations. Attorneys will have to be aware of how cash flow will be reallocated when it is tax neutral and consider integrating divorce financial planning to a greater extent for achieving intended financial outcomes. Lastly, other tax deductions that have been phased out have a sunset clause in 2026 and may or may not be repealed. Thus, language to incorporate unknown tax law changes in the future has never been more challenging. Alimony has been a way of shifting tax responsibility where taxable income is taken from one spouse and given to the other. There was an opportunity to create “free money” between the parties when one was in a higher tax bracket than the other because the IRS ended up subsidizing part of the alimony payment. Typically, alimony was one of the last pieces of the puzzle to fall into place after child support and property division. Systems for balancing the tax effect of reallocating income and property which rely heavily on tax code are now in disarray and present vanishing opportunities for ameliorating tax burdens between spouses. It seems the payor will simply have less money on an after-tax basis with which to pay an ex-spouse. Not only will the payor lose the tax deduction, but without it, some may be pushed into a higher tax bracket. Other familiar rules will no longer apply: no recapture rules; no automatic termination upon death; and, no child contingency rule. Who feels this impact? While it seems that only 10% to 20% of all divorces involve alimony, 98% of alimony recipients are women. And, divorced women over the age of 65 are especially high risk for ending up in poverty based on financial inequalities that divorce creates which are never overcome. The new tax law seems to penalize less wealthy couples where alimony payments come from future paychecks – not from the transfer of income-generating assets that exist for wealthier individuals. When combined with child support, the availability of sharing after-tax income is much narrower. Further, spousal support funds would appear not to be eligible to the payee for investment in an Individual Retirement Arrangement account that is restricted to taxed income (compensation). This means for many payees, they will not have the option to save for retirement from alimony. The fact that alimony is not considered earned income strongly implies that payees may lose earned income qualifier status for all kinds of credit applications, such as mortgage, home equity loans, leases, etc. To qualify, one has to prove support payments exist, are received consistently and on a timely basis pursuant to a legal order, have been received for at least one year, and are due for another three years. Since support payments will have no tax trail, the only acceptable proof will be canceled checks, records of deposits, etc. so lenders can verify it. Perhaps the ray of sunshine here is that since both alimony and child support are non-taxable income, the total will be grossed up for mortgage qualification by 125% of the amount one receives. This hopefully enables your client to lower their debt ratio and increase their chance of getting approved. Alimony trusts are also affected by the repeal of Section 682 of the IRS Code and do not seem to be grandfathered for existing trusts. Here, the income distributed to the divorced beneficiary was taxed as income to the beneficiary; now, it will be taxed to the spouse who established the trust, who will have to pay income tax on the trust income distributed to an ex-spouse. In most cases, this will be a surprisingly undesirable result and all trusts, in which either of the divorcing parties has an interest, should be reviewed carefully for actual tax impact. If states rely on existing formulas or approaches for calculating alimony, it is clear that awards will be inequitable and unfair based on the historic basis for parties’ sharing of the income tax subsidy that is no longer in effect. Modifying existing awards must use specific language to avoid not being subject to the new tax law. However, if there is a modification after Dec. 31, 2018 of a pre-2019 instrument, and the parties agree to apply new tax rules under the Tax Cuts and Jobs Act within the first two years of the alimony term, recapture may still be an issue – if there is a sudden reduction in alimony amount. This is unclear as of yet. Each state calculates child support and/or alimony differently, either on a gross or net income basis, with or without formulas. Tax calculations will have a big impact on the ultimate result of sharing net disposable income between parties. Will it be incumbent upon professionals to be fact-specific concerning the tax impact on families for credits and deductions to balance the financial impact of nontaxable support? Will states rally in time to legislate new laws? Will courts find equitable relief in finding adjustments or factors for deviation for determining a presumptive award? Will alimony become even more discretionary and subject to uncertainty? These uncertainties make it incumbent upon family law attorneys to seek tax advice and structure agreements for future changes. As we know well, conflicts over money are common after divorce, especially when it comes to child support. If the court focuses on the “best interests” of the child as the primary standard, child support will be the “defining payment”, and as such, quantified by state guidelines and formulas as well as by the child’s needs and age, not by the spouse’s. There will no longer be the opportunity for former spouses to trade dependency exemptions to achieve equitable tax relief when personal exemptions are eliminated under the new rules. Personal exemptions are being replaced with higher standard deductions. The idea of now having undifferentiated family support be tax neutral (aka alimony and child support) may fuel some of the most contentious issues of divorce around child custody. Generally, only one parent may claim all the child tax-related benefits for a child, including the child tax credit, the dependent care credit, the exclusions for dependent care benefits, and the EITC (earned income tax credit). The new tax rules eliminate the dependency exemption but retain the definition of the dependent for claiming the child tax credit and other child-related tax benefits. Under a special rule, the noncustodial parent may claim a dependency exemption for a child if the custodial parent releases the exemption, and thus, also claim the child tax credit if all other requirements are met. For those parents who are alternating years in which they claim a child as a dependent in order to share tax benefits post-divorce, they may now find themselves in a different tax situation where dependency exemptions have zero value. This begs the question if they should exercise ad hoc “true-ups” to conform with the intent of the agreement. However, only the custodial parent may claim the dependent care credit and the EITC because the child must meet the residency test for a qualifying child. These benefits were left intact and unchanged with new rules. In 2018, the child tax credit doubled and is worth up to $2,000 per qualifying child under the age of 17. The earned income threshold for phaseout has increased to $2000,000 for single filers. These tax credits may seem like a boon to lower and middle-class families and could even tip the custody negotiations. Alimony can be payments made to third parties on behalf of your client’s ex-spouse in the form of cash, checks, or money orders under the terms of their divorce agreement. These include payments for an ex-spouse’s medical expenses, tuition, housing costs, mortgage payments, home equity line of credit payments, and property taxes. Under a divorce decree, the payor can deduct these payments as alimony and the receiving ex-spouse must report them as alimony received. The payor benefits from direct payment of these expenses because he/she can better utilize them. Often, these housing-related payments assist the lower income spouse by allowing them to stay in the marital home. If the home is a qualified home, the receiving ex-spouse as homeowner can also deduct the real estate taxes and mortgage interest as itemized deductions. If the home is jointly owned, the payor can deduct up to one-half of these payments as alimony and the payee reports these payments as alimony received. However, with the new tax law, the payor spouse faces competing options if they own their own home because they are limited with respect to reduced tax deductions. The new limits for mortgage interest deduction, the zeroing out of home equity line interest, and the cap on property taxes further constrains incentives for spouses to pay these expenses as a form of alimony for the purpose of keeping a spouse in the former marital home. 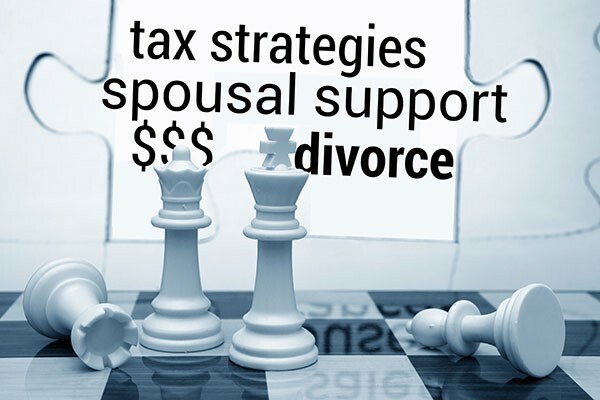 Divorce has become a tax strategy game without clear direction since the repeal of the alimony deduction has not yet come into play. As professionals, we must consider how to address the ripple effect of the repeal of the alimony tax deduction and other uncertainties in the new tax law. Should we also consider the potential for the repeal of the disallowance of the alimony tax deduction? Will we have to plan for the return of personal tax exemptions and deductions? Will we have to plan for an “outlet” clause in every written order: when to renegotiate and/or return to mediation, arbitration or court? Should we make sure that if an agreement is executed after 1/1/2019, and the alimony tax deduction is restored, that alimony may not become suddenly taxable to the recipient (devastating impact) and must be renegotiated to preserve intent? We face a changing landscape in what used to be an arena where alimony was becoming more formulaic and predictable. The dynamics at the bargaining table are topsy-turvy again. The threat to the financial security for lower income spouses is heightened and unknown at this time. The many forms of alimony depending on which state you reside in may be eliminated simply out of practicality due to an eliminated capacity to pay. There is a call to arms to explore carefully tax language for alimony and its contingencies as well. Now more than ever, examining legal, tax and financial options to achieve comparable results becomes an essential part of every divorce case. The U.S. Census Bureau, 2015.